Ask The Bellwether: How can I combine two full spindles? How can I combine two full spindles? One thing spindle spinners focus on is how much yarn they can get on their spindles. I've talked about this before more than once. 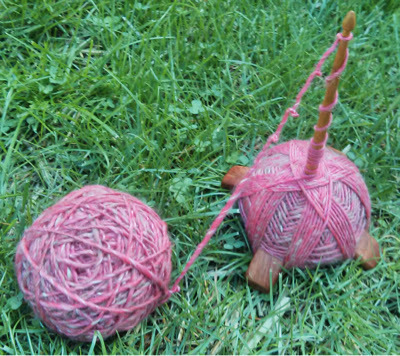 Another way to get more yarn is to combine two full spindles of singles. You can do this for singles-that-will-remain-singles and also for singles that you plan to ply. First, plan your approach. Do you have two spindles? 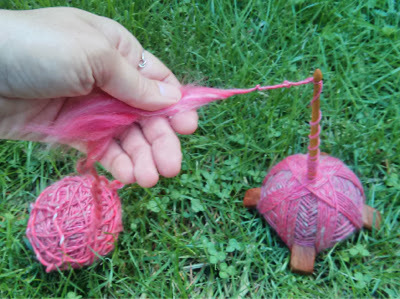 If you have only one, can you easily remove the cop of yarn you've spun onto it, or do you need to unwind the yarn from the spindle to remove it? Step 1: Fill a spindle. When you have put all the singles on it that you plan to, leave a fluffed out end that is as long as the fiber' staple length as if you were going to join. Fold the last 8 inches of yarn back on itself to self-ply so you don't lose twist, and set it down. See photo above. If you are going to have to empty the spindle by unwinding, wind it off into a center-pull ball with the tuft of loose fiber at the center. Step 2: Repeat step 1. 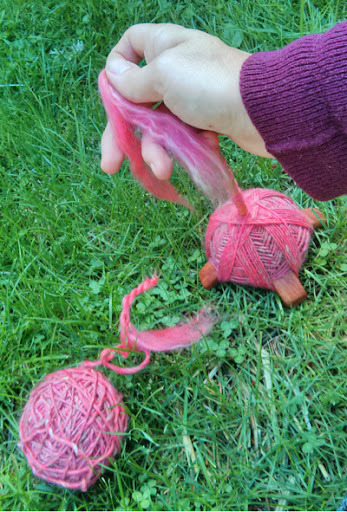 If you removed the yarn the first time, do not remove the yarn from the spindle this time. Step 3: Open up the tuft at the end of the second spindle-full into a V. Draft out the fluffy end from the first spindle-full a little and put it inside the V. You may feel like this needs an extra hand or two, as you will have to stop the active twist from both cops of yarn from getting into the join while you form it. Now, draft the fluffs together until they are the right size to let twist in. Give the (second) spindle a twirl to add more twist so that the joined fibers have the same amount of twist as the rest of the yarn. Now, you have joined the two spindle-fulls together. 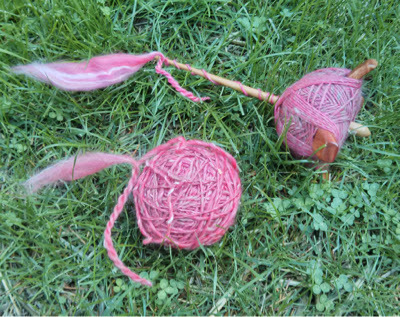 At this point, you most likely will need to wind the first spindle-full on top of the second spindle's cop, so there is one big ball, to find the inside end of the first spindle-full to wind the skein from. That is, unless you used a Turkish spindle ... Then you might be able to find the inside end of the first cop and can start winding the skein from there, working through the first cop, past the joining of the two cops, and then continuing on to the second cop. If you want to join several spindle-fulls together, leave fluffed out or extra fiber at both the start and end of each spindle-full, so you can keep adding on. I find this easiest with Turkish spindle yarn turtles, and could see spinning them together into a chain of turtles to make a spindle-spun skein heavier than I could ever have spun on the spindle.